"This makes a shiny gloss finish on most any cookie. It works best on light-colored cookies, like sugar cookie cutouts. Depending on the color you are going for, you will probably need between 2 and 8 drops of food coloring." Mix egg yolk and water. Divide into dishes for as many colors as you want to make. Add food coloring to get shade desired (e.g., 2 Red plus 2 Yellow for Orange; 3 Blue for Blue). 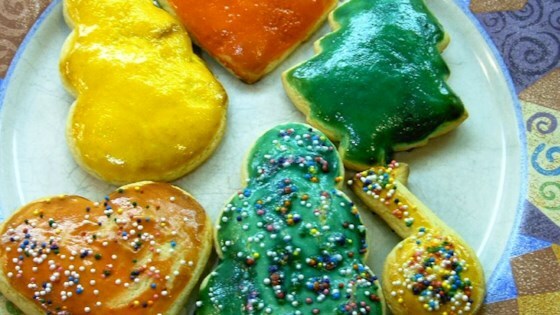 Paint on unbaked cookies and bake as you normally would. Cookies will come out with a shiny color finish. tasted nasty and made the cookies look really sick! This was a very pretty addition to my sugar cookies. A light orange would be perfect for pumpkin cookies for this Halloween!